Simple & Sincere: Go Green! 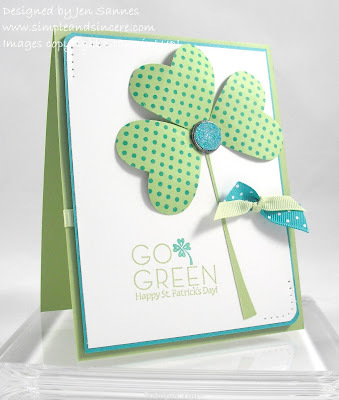 Today's card celebrates the greenest of holidays - St. Patrick's Day! :) I demonstrated this card at Tuesday's downline meeting. I made the shamrock using my Full Heart punch - I stamped some scraps of Certainly Celery cardstock with my Dot, Dot, Dot stamp (in Bermuda Bay ink) and punched out three hearts. I gave the "leaves" a bit of dimension by pulling the heart over my bone folder, causing the cardstock to curl slightly. I cut out the stem, added the heart-shaped leaves and used a Build-a-Brad for the center of the shamrock. The Build-a-Brad is covered with a 1/2" Bermuda Bay circle with some Dazzling Diamonds for a little shine. And don't forget that fun Go Green stamp! First, I stamped it in Certainly Celery ink and colored in the clover with my Bermuda Bay marker. I hope you enjoyed today's project - see you back here soon! Who knew Bermuda Bay on Certainly Celery can look so good! A Little Taste of Spring!